With 115 pledged delegates, North Carolina is the biggest state remaining on the Democratic primary calendar. A strong victory there on Tuesday, May 6, would virtually guarantee Sen. Obama a pledged delegate lead at the end of the primary season, not to mention erase any gains made by Sen. Clinton in Pennsylvania. Polling has consistently shown Sen. Obama in the lead, but with aggressive campaigning in the final days, the gap is closing and Sen. Clinton will continue to do everything she can to remain in this race. As in so many other states, this one is going to come down to the organization and ground game, and our folks need your help! Sign up today to volunteer in North Carolina! Visit http://my.barackobama.com/page/s/cometonc to provide your information to the campaign, and a local organizer in NC will get in touch with you on details, including transportation and housing. If you can't make it to North Carolina in person, your help is still needed to phone bank from home. The North Carolina team has set up a great online tool to let you call from home at http://my.barackobama.com/ncvols. By making just 50 calls (takes about 2 hours), we can give the team on the ground a huge boost before election day on May 6. Let's get out there and win this one for Obama, and then on to victory in November! Last Day to Register to Vote in Oregon Primary! Today, April 29, is the last day to register to vote (or change your party affiliation to Democrat) in order to be eligible to participate in the Oregon Democratic primary on May 20. Anyone who is a resident of Oregon and will be 18 years old on or before May 20, 2008, can register for the primary. Remember, Oregon is a completely vote by mail system, so you must re-register if your permanent or mailing address has changed since you last registered. You should also re-register if you have not voted for the last five years or more. Oregon is a CLOSED primary, meaning that only people registered as Democrats can vote in the Democratic primary, so voters should also check to make sure they have the correct party registration by today. For more information, visit the Oregon Secretary of State's website or your local Oregon for Obama field office. If you're already registered, you can help make sure others are registered by the deadline today by helping to call Oregon residents using the campaign's online Oregon phone banking tool. Help Phone Bank for the Guam Primary! We are phone banking for next primary - Guam! We're working with the Obama Guam Coordinator Ria Baldevia and calling people in Guam right now. Ria has created a great script for the calls, so it is very easy to make the calls. If you have AT&T or Sprint wireless, nationwide plans include Guam. AT&T and other landline nationwide plans include Guam as well. Guam is 18 hours ahead of the pacific time zone, so best times to call will be between 3 pm -3 am pacific daylight time (9am-9pm Guam time). If you are interested in helping out, please let Grande know at grande@accordence.com or 650-340-9150. We basically need volunteer callers between now and Friday May 2 (which is May 3 in Guam). Please do forward this to others who may be interested as well. Big props to Ria Baldevia for helping the campaign open and run the Guam office so let's all wish her the best leading up to May 3rd. In the meantime, please check out "U.S. Presidential Battle For Guam Heats Up" and listen to Maya Soetoro-Ng on News Talk K57! 3 millions votes have already been cast for an upcoming Moveon.org Obama ad. If you've got lots of free time, why not take a look? Update: Over 4 and a half million votes have been cast.You may have to sign in your name and email, but it's a one-time deal. Then, sit back, admire the creativity, and vote. After Pennsylvania: What Really Matters? Hillary Clinton won Pennsylvania and now all the pundits ponder the meaning of 10 points--the new numerology for the new millennium. Some try to read the minds of the "bitter" white working class. Some conclude that there is a winning magic in the dark arts of negative campaigning. Some dismiss Clinton’s victory as an illusion and others praise her miraculous comeback onto the stage. Frankly, after spending last week away from the elections and marching 28 miles with thousands of different workers in Los Angeles, I find this whole show to be really ridiculous. It is too easy to be caught up in this superbowl of elections and its recent devolution to “kitchen-throwing” game play and forget what this race is really about. For some of us, this election is not about whose more electable but something deeper. Pennsylvania predictably went with its native daughter tonight, but based on early returns, the win was not enough to catch up to Barack Obama, who continues to lead the race in delegates, the popular vote and number of states won. One analyst did the math factoring in the delegates won tonight and said "it now appears that it's going to be impossible for Obama to lose his lead" among pledged delegates. Anna Perng, Matthew Chea, Nina Ahmad, Van Tamom and the entire Pennsylvania Asian Americans for Obama team did an outstanding job against incredible odds. And based on early ward breakdowns in Philadelphia, we'll see their impact on helping win the vote for Obama in entire sections of the city. Sen. Obama continued to inspire thousands of new voters in Pennsylvania to participate in the political process -- new voters who will be crucial allies for change in the general election when the electorate will be faced with choosing the Republican flag bearer of the old Washington and Barack Obama, who represents a new and better path towards moving our country forward. Meet Saleem, a superstar volunteer from Pittsburgh who has been doing an amazing job recruiting volunteers for the Obama campaign. "My motto is any person who speaks or walks is fair game to try to convince them to work for Barack Obama." Casperr, a Daily Kos diarist, has given our Philly grassroots team a terrific shout out by posting a diary about the diverse group of volunteers that worked out of the Chinatown office the last couple of days. Again, a big thanks to our very own Nina Ahmad, Matt Chea, and Anna Perng who have been leading the grassroots effort our in Philly (and are pictured in the diary), as well as the inestimable Van Tamom, Pennsylvania AAPI Outreach Director for the Obama campaign, who I had the distinct pleasure of working with in Texas. Connecticut State Rep. Bill Tong was also on hand to help campaign for Sen. Obama. Let's help our folks in PA make the final push! Make calls today through the online phone banking tool! Show Obama that AAPIs support him by making a contribution through the Asian Americans for Obama MyBO page. Read the rest of casperr's post here. Chinese-language daily World Journal profiles Chris Lu in their April 20, 2008 edition. Lu was Barack's Harvard Law School classmate and serves as a trusted advisor on the campaign and in his Senate office. Lu is also quoted on Obama's 'wonkishness' in this November 2006 article in the Washingtonian. It may not be the type of fervor we see in Obama, Japan, but some Taiwanese would prefer to see Barack Obama as the next US president. This is the island, after all, where the majority of Democratic American expatriates voted for the Illinois senator. Either way, many Taiwanese, despite support from Republican administrations in the past, now feel that it's in their best interest to have a Democrat in office. Here's a picture from Flikr titled "Obama in Taiwan"
And one of the last places where you'd expect to find him. Also from Flikr. Preeta Bansal advises Obama on international human rights, legal issues, foreign policy, women's issues, and outreach to Asian-Americans. He is 'able to advance progressive principles, but he's not one of those starry-eyed liberals,' Bansal told the publication, National Journal. 'With him, two plus two equals five, not four. The whole is greater than the sum of the parts." 7 AM - Primary Day!!!! GOTV!!! Have a spare room? Need a place to crash for the convention? List what you have or what you need at http://www.texansforobama.com/housing. Remember: You are the ones you have been waiting for, so please do not wait for us to match folks. Do as much followup and contacting as you can. When you have made a match, email housing@texansforobama.com so we can take you off the list. "Thanks to all for your continuing offers of help. We've met our fundraising goal for phone and internet! There were over 400 API calls made this weekend from our Chinatown Office on Saturday and Sunday alone. We canvassed two huge events (Cambodian Lunar New Year at a Cambodian temple; Japanese Cherry Blossom Festival with over two thousand people). South Asians For Obama (SAFO) held two Town Halls on Health Care with over 100 people in attendance. Korean Americans for Obama held a press event with six Korean newspapers and successfully raised money to buy ads through the week. Asian Pacific Americans for Progress held its free tax clinic, receiving plenty of press on KYW radio and local papers. And yes, our very own Matt Chea was on Voice of Khmer, talking about Barack about health care! Our two Japanese volunteers also did visibility and even met Michelle Obama at Haverford College. " Saturday, April 19 - Philly Chinatown API GOTV kick-off w/ special speakers and dim sum. Make Calls to AAPIs in Pennsylvania for Barack! Last week, the campaign announced its Asian American Online Phone Banking tool for Pennsylvania. The tool enables AAPI supporters across the country to call Asian American voters in the following ethnic groups: Korean, Chinese, Vietnamese, Cambodian, and South Asian voters. The campaign has had a great response, but with only a week left and so much at stake in the Pennsylvania primary, more help is always needed! They want your help – as well as the help of your friends and colleagues – to reach out to AAPI voters in the critical last week and a half in Pennsylvania. They are especially looking for Chinese, Korean, Vietnamese, and Cambodian callers, who can use the online tool. Anyone who wants to call and has not yet signed up should email Van Tamom, AAPI Outreach Director for Pennsylvania, at vtamom@barackobama.com with their name and email address and he can set you up. We are doing calls 10am – 9pm EST. AAPI's did great this past Sunday at the California Democratic Caucuses to elect district-level delegates. Out of the 241 delegates elected, I estimate that there were about 15 AAPI's elected as delegates for both Barack Obama and Hillary Clinton. For Obama, I counted about 7 AAPI elected district-level delegates. Congrats to all, especially since they were really competitive contests! In CD 33, my district, some candidates were running radio ads!!! Anyway, I did some research on the process to select at-large and PLEO (Party leader and elected official) delegates. Here's what I found, particularly as it pertains to AAPI's in California interested in going to Denver to represent Obama! These ballpark figures are based on the estimate that there were 15 AA/PI elected this past Sunday, and doesn't include alternates. Given the affirmative action goals articulated by the state party of 9% AA/PI, the 241 district-level delegates should aim to select at least an additional 18 AA/PI delegates through the at-large and PLEO process. Of course at the end of the day with all the affirmative action goals and the rule that the gender split needs to be even, I won't try to venture a guess as to how many of our 8 Obama AAPI delegates will need to be women v. men. For more info on the at-large and PLEO process and for application forms, go here. The deadline to apply is April 23. This Saturday, April 19, we will stand united as a nation for change in support of Barack Obama and a better vision for our nation. Change can't happen without you. On Saturday April 19th supporters of Democratic Presidential candidate Barack Obama will hold simultaneous "Nation for Change" rallies across all 50 states and abroad. To find a "Nation for Change" rally near you, visit the "Nation for Change" website and click on the Web Train Express. You can also click on the picture above. I'll be representing Asian Americans for Obama at the Austin rally this Saturday from 12 to 4 PM at Eastwoods Park. A flyer for the event is available for download in the Supporter Toolkit. Volunteer for Final Week of APA Outreach for Pennsylvania Primary! This is it – the FINAL WEEK before the Pennsylvania Primary! I'm nervous. Remember, the key is to maintain, if not INCREASE, Obama's popular vote lead as well as pledged delegate lead. And to do this, he needs you! Two weeks ago, polls, assuming you can believe them in this primary season, had Clinton ahead by 16%. This week, her lead has dropped to 6%. Can we win PA? I hope so and we are sure going to try! I hope that you will join us in some of them so that Obama win once and for all! On Saturday April 12, 2008 from 10:00 a.m. to 3:00 p.m., a group of volunteers, community leaders and elected officials who embrace Presidential Candidate Senator Barack Obama's message of inclusion and empowerment provided a free tax clinic targeting those Philadelphians (earning between $3,000-8,750) who traditionally do not file for taxes. In the spirit of Obama's commitment to inclusion and grassroots community empowerment the primary organizers of this event, Asian Pacific Americans for Progress (a grassroots, internet-empowered, national network of Asian Pacific Americans and allies for Progressive Action), United People for Obama (Philadelphia Coalition of diverse Obama Supporters), Solutions for Progress (a technology public policy company who specializes in anti-poverty software) kicked off activities with a multicultural opening ceremony of a dragon dance and prayer from Reverend Shine and opening words from Pennsylvania Senator Vincent Hughes. New Subtitled Versions of Si Se Puede Cambiar Music Video Now Available! A multilingual version of Si Se Puede has been posted. A multilingual version has subtitles in 8 languages (Spanish, English, Traditional and Simplified Chinese, French, Korean, Vietnamese, and German). A Chinese version with both simplified and traditional Chinese on the same video, making things easier. Go after the jump for direct download links. We have become vultures over the carcass of intelligent discourse. Once again, Hillary has swept down on the words of Obama, this time labeling him an “elitist” while regaling us with tales of her youth shooting a gun with her father. The traditional rules of campaign engagement forces us to substitute substantive discussion with fingerpointing and selective listening. Oddly enough, Obama was repeating an analysis that has circulated throughout the Democratic Party including by the Clintons themselves for the last few years. (From the white labor movement's advocacy of the 1882 Chinese Exclusion Act to the 1990's beating of Chinese American Vincent Chin by two white autoworkers who blamed the loss of their jobs on Japan, history has shown us that Asian Americans/ Pacific Islanders cannot dismiss Obama's comments as "elitist" but something that resonates close to our experiences and warrants real discussion). Internship Opportunity in Pennsylvania for Students! Obama for America is thrilled to offer a unique internship experience to students across the country! What? Join in the thrilling final days of the Obama campaign in Pennsylvania! If you can arrange for travel and can stay until Tuesday at 9:00 PM, th campaign will provide housing at no cost to you. If you've been with the campaign in other states, you know that your experience will be unforgettable. If you've been meaning to get involved but haven't yet, your moment is now. 4. When can you arrive in Pittsburgh? 5. Will you have a car? Congratulations to Jay Chen (CD38), Brian Wang (CD8), Roger Hu (CD14) and Molly Kawahata (CD14) for winning Obama delegate seats in heavily competitive Congressional district caucus elections today in California. Angelica Jongco (CD12) said that she and Michelle Yuen (CD26) didn't make it. We're still waiting to hear results from the other Asian Americans vying for delegate spots. I showed up at the CD8 caucus 30 minutes before the 2 p.m. voting started and there were already a good 50-plus people line. Delegate candidates and their campaigners were going up and down the line passing out flyers and other materials. People were hawking buttons, t-shirts, even fruit, and passing out bottled water. UPDATE 10:07 p.m.: Jenn Pae just called me to say that she won the second of the two female delegate spots in CD9 -- which is great news not only in the win, but because Jenn was one of the people cut and later restored last week as a candidate. We have great news from Van Tamom, our Director of AAPI Outreach for Pennsylvania. We will have an online call tool for our AAPI supporters across the country to call Asian American voters in the following ethnic groups: Korean, Chinese, Vietnamese, Cambodian, and South Asian voters. We would love to get all of your help – as well as the help of your friends and colleagues – to reach out to AAPI voters in the critical last week and a half in Pennsylvania. Unlike the online AAPI call tools we have used in earlier states, the PA online call tool we will be using does not allow us to upload language-specific scripts so if you or your friends are interested in helping out, please contact Van Tamom directly at vtamom@barackobama.com. Please email Van your name and email address, and he will send directions for the call tool, additional information that will not be available on the online call page and help you walk through the call process. If you would like to organize phone banks with individuals who will not have access to computers, please email Van that you are interested in getting paper call lists, and please indicate how many volunteers/lists you expect at your phone bank will complete. Please email Van by 1am EST/10pm PST tonight if you are interested so he is able to get the logistics worked out as soon as possible. As many of you know, we are in an extremely tough uphill battle in Pennsylvania, and every single call – especially calls to smaller universes like the Asian American community in PA – will make a difference in this primary. We encourage you all to donate as much time as you can spare to this important effort. As a Sikh American whose family settled in America 100 years ago, this election is different than any other my family has seen. This is the first election where I believe the future of my community and country rests on our support of a single presidential candidate: Barack Obama. Sikhs will have a choice on February 5th: we can stick to politics-as-usual, or we can join a movement in this country. A movement where people divided by race, religion, and politics are finding the courage to recognize themselves in one another and come together in a common cause. A movement that would end the old politics, in which Sikhs are forever minorities asking to be accommodated, and usher in a new politics of unity that ties Sikhs to all Americans in the same struggle for freedom. Obama alone represents this movement. Its momentum is real. We are already part of it. I have witnessed it. A great example of AAPI Obama supporters--and supporters of all backgrounds stepping up in their communities. It's being spearheaded by Nina Ahmad, who sits on the board of APAs for Progress. On Saturday April 12, 2008 from 10:00 a.m. to 3:00 p.m., a group of volunteers, community leaders and elected officials who embrace Presidential Candidate Senator Barack Obama’s message of inclusion and empowerment will present a free tax clinic targeting those Philadelphians (earning between $3,000-8,750) who traditionally do not file for taxes. There are 14 million people nationwide who are not on the tax rolls and will fail to receive this rebate check of a minimum $300. In addition, this tax filing will help eligible older Pennsylvanians to secure up to a $650 property tax/rent rebate. In the spirit of Obama’s commitment to inclusion and grassroots community empowerment the primary organizers of this event, Asian Pacific Americans for Progress (a grassroots, internet-empowered, national network of Asian Pacific Americans and allies for Progressive Action) and United People for Obama (Philadelphia Coalition of diverse Obama Supporters) will kick off activities with a multicultural opening ceremony, and provide free refreshments throughout the day. Ryan Kim, a passionate grassroots volunteer who has worked to get out the vote for Sen. Obama in NY, NJ, and PA, was featured on a Korean news program discussing the Democratic contest along with a Clinton supporter. The piece aired on Feb. 4 on MKTV, which broadcasts in NY, NJ, CT, and PA. I don't speak Korean, but I'm told that this isn't the most in-depth piece in terms of its analysis and discussion of the candidates, but it's exciting to see the Asian American community focusing on the race. For more of Ryan's videos featuring Korean supporters of Obama, visit his YouTube page here. UCLA Professor Tom Plate discusses his cautious optimism about the three candidates' campaign rhetoric on US-Asia policy in his Pacific Perspectives column this week. He writes that Asia policy (outside of Pakistan and Central Asia, presumably) has not been a visible priority for the US lately, despite the growing economic and political importance of nations such as India and China. Professor Plate notes that Asia has not been exactly center stage for the presidential contenders either, but encouragingly, all three candidates have articulated positions on Asia that emphasize engagement, "geopolitical reality," and avoid extreme or belligerent rhetoric. He's critical that none of the candidates have really laid out a comprehensive Asia policy in-depth, but feels that we should generally be optimistic. "Obama also offers the world a unique Asian connection as well. With his late Kansas-born mother and stepfather, he resided in Indonesia for a quartet of younger years. A recent speech emphasized the need for 'strong ties with U.S. allies such as Japan, South Korea and Australia.' The 46-year-old senator -- potentially the first black American president -- also has proposed to help forge 'a more effective framework in Asia that goes beyond bilateral agreements, occasional summits, and ad hoc arrangements.'" April 4 marked the anniversary of the death of Rev. Dr. Martin Luther King Jr. Both Hillary and McCain traveled to Memphis , the site of Dr. King’s final moment, to honor his memory. McCain used the moment to apologize for voting against the creation of a Dr. King federal holiday. Hillary related a personal story of how Dr. King affected her growing up. However, to the disappointment of some, Obama chose to pay tribute in Indianapolis. Some critics immediately concluded Obama is ignoring the African American community as a given vote in his pursuit of the presidency. Of course, a similar analysis can be made of McCain and Hillary’s visit to Memphis as an effort to court the votes of this same group. Intentions can be widely debated but Obama’s decision to make his speech in Indianapolis highlights an aspect of Dr. King's message that holds more relevance for Asian American / Pacific Islanders. To ensure a solid outcome on the 22nd, we need your help to make calls urging people to vote for Obama. Where: SF Station - 1475 Folsom Street, St. 200, SF (at 11th St.) The Palo Alto and Oakland Obama offices are also hosting phonebanks if those offices are closer to you. Please bring your cell phones and chargers. Wireless is available if you have a laptop. Snacks and friends are welcome too! This PA spot features Senator Obama's sister, Maya Soetoro-Ng, and his grandmother, Madelyn Dunham, in her first campaign appearance. On an offbeat note, Lorrie Xie made this hilarious clip about the presidential race. AAPI for Obama rocks!! Huge thanks to Elizabeth for continuing to organize NYC volunteers! We're lucky to have full-time volunteer Helen Liu (Ramey's Yale classmate!) work with Van. This teamwork is just incredible! *canvassed AAPI sites: 3 stores, 2 shopping centers, 1 Cherry Blossom Festival event, 1 Cambodian banquet w/ 500 guests (Van spoke!! ), and 1 Chinatown. See more AAPI outreach pics from PA after the jump. The primary in PA is coming close (April 22nd) and we need to do canvassing in our community here in Philadelphia, PA for the next two weeks. I have several neighborhoods (North and South Philadelphia) and also a couple of shopping centers that we can target. With our Cambodian New Years approaching this weekend, we can also hit Buddhist temples, churches, and the many parties that the community throws. The campaign has several flyers that we can work on together to translate. I have not a chance to work on the translations nor do I have the fonts. If someone can help me, that would be a tremendous help. I attempted to contact the Khmer Post, the local and National newspaper who might be doing an article on the grassroots efforts of local leaders for the Cambodian-American community. Van, who is the Asian American Pacific staffer for the Senator is Cambodian-American is here in Philadelphia and is working with me here. We opened a Chinatown office and we are doing our Asian-American outreach from there if anyone wants to visit. We will be also doing phone bankings and targeting our community if people are interested in helping us out. It is easy and if you need help Van and I can show you how to do it. Van also has a letter that the Senator wrote for our community that once it's approved we can send to you guys. We also need any ideas or suggestions that you can offer us. I know there are several other Khmer communities outside of Philadelphia i.e, Lancaster, York, Lebanon, Upper Darby and several other townships and boroughs if you know any else, please forward them to me. If you know any Khmer supporters here in the Philadelphia and Upper Darby, PA and even Camden, NJ who want to help out financially and become volunteers, please contact me or Van ASAP. If you need lodging and you would like to come to Philadelphia this weekend or the next please contact me, you can stay with me or at my brother's house. Please email me at mattchea@gmail.com or call me at 267-237-8340. Dozens of Asian Americans in California and in other states are hoping to stand out in crowded fields of candidates to become Democratic National Convention delegates for presidential candidate Sen. Barack Obama. Many of the Asian American delegate candidates are heavily involved in the Obama campaign as grassroots volunteers. Some have traveled to other states to help the Obama campaign in the various primaries. Pledged district-level delegate positions will be elected by Democratic caucuses on April 13. The deadline for candidates to file as delegates was April 2. Obama was allocated 107 district-level delegates from California's primary election results. The delegate selection plan goals set by the California Democratic Party include having nine percent of its delegation be represented by Asian Americans and Pacific Islanders. Many of the districts have 50 or more candidates for just a handful of delegate spots (http://tinyurl.com/2kts4c). Delegate positions are also allocated between women and men in each district for gender balance. In some districts, there may only be one Obama delegate, resulting in a spot for a candidate of only one gender. There are also separate spots for At-Large delegates and Party Leaders and Elected Official delegates, which will be chosen at a May 18 party meeting. Some of the Asian American delegate candidates for Obama in California are profiled below. 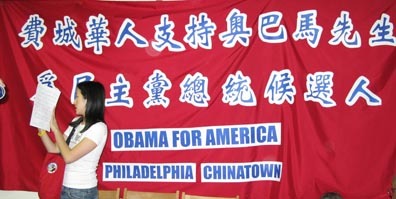 Asian Americans for Obama in Pennsylvania: Contributions Needed! On Wednesday, April 2, Sen. Obama concluded his six-day "Road to Change" bus tour by thanking volunteers in Philadelphia. Many Asian Americans were present, thanks to the efforts of our Pennsylvania Asian Americans for Obama coordinators, Anna Perng, Matthew Chea, and Nina Ahmed. They deserve mad props for their amazing efforts to register Asian American voters and gathering the resources and volunteers to open and run a Chinatown office in Philadelphia. Right now, they need our help to raise money for phone and Internet lines at the Chinatown office. To pay for the lines and the bills through the Pennsylvania primary on April 22, they need to raise at least $500. If you haven't maxed out to Sen. Obama and are looking for a great way to contribute to the grassroots, contact Anna Perng at anna.perng@gmail.com to find out how to donate. If you're looking to help out in the Philly area, contact Anna, Matt, or Nina through the e-mail links above. Below are some pictures from the Philadelphia volunteer event. It's great to see Van Tamom, the Obama campaign's AAPI outreach coordinator with whom I had the pleasure of working in Texas. He's the guy on the right in the first photo. On Saturday, April 12, Obama supporters all across the country will join together in a massive, simultaneous national rally. Grassroots events such as this are why more and more Americans are responding to Sen. Obama's call for change. America is tired of the divisive, cynical politics of the past and hungry for a new vision and a new direction. We are a movement because we are united; we are united because we hope; and we hope because we believe in America and the power of patriotic Americans to change Washington and the world. Let's show the world that Asian Americans are standing up for change with their fellow Americans and Sen. Obama. For far too long, politicians and politics have ignored or belittled the voice and role of our community. Because of Sen. Obama's call for all Americans to take the future of this country into our own hands, Washington is finally waking up to the power of the American people, which includes not only Black and White, but Asian, Pacific Islander, Latino, Native American, hapas, and more. Find the rally nearest you by visiting the event site. There are already events planned in more than 38 states nationwide. More information after the jump.